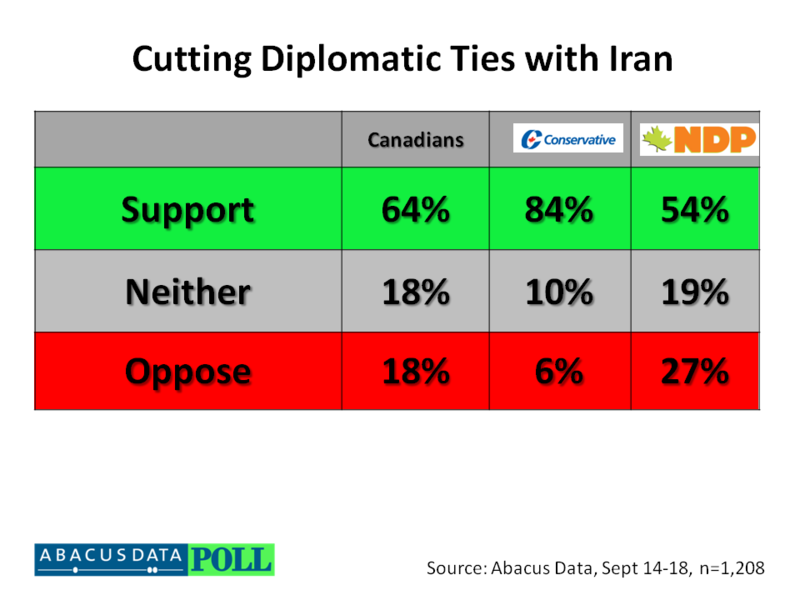 A new survey conducted by Abacus Data finds a large majority of Canadians (74%) believe that the Iranian government will likely develop nuclear weapons within the next five years and a majority believe (60%) they would use them against other countries. Nonetheless, Canadians were divided on whether Canada should take part in military actions to prevent Iran from obtaining nuclear weapons with a majority opposed to any ground invasion that involved Canadian troops. When asked to rate the level of threat the Iranian government posed to people living in Canada, Israel, and Europe, the perceived threat to Canada was considerably lower than that of Israel and Europe. Overall, 14% of Canadians surveyed considered the threat of the Iranian government to Canada as high, with 32% considering it to be moderate and 53% considering it to be low or posing no threat at all. In contrast, 66% of Canadians surveyed considered the threat to Israel posed by the Iranian government to be high with another 23% considering the threat level to be moderate. When it came to Europe, threat perceptions were lower than Israel but higher than Canada. One in four respondents (25%) consider Iran’s threat to Europe to be high while 47% considered it to be moderate. A large majority of Canadians (74%) surveyed believed that the Iranian government is very likely or somewhat likely to develop nuclear weapons in the next five years. Fifteen percent said the chances were either somewhat unlikely, very unlikely, or that there was no chance at all. When asked what the chances were that the Iranian government would use a nuclear weapon against another country, 60% said the chances were either very or somewhat likely while 28% believed it was unlikely that the Iranian government would use those weapons against another country. Despite the fact that most Canadians believed the Iranian government would develop and use nuclear weapons, support for specific actions against Iran were varied. Canadians surveyed overwhelmingly supported stricter economic sanctions (80% strongly/somewhat support) but support was less likely when it came to cyber warfare (52% support), bombing Iran’s nuclear facilities (37%), and launching a ground invasion involving Canadian troops (25% support). Moreover, although Canadians believed the Iranian government posed a high level of threat to Israel, only 22% believed that Canada should support any military action launched by Israel against Iran’s nuclear facilities. Another 59% believed Canada should not get involved while 19% were unsure of what Canada should do. At the end of the sequence of questions, respondents were given information about the federal government’s decision to close the Canadian embassy in Tehran and to expel Iranian diplomats from Canada. They were given the arguments put forward by Foreign Affairs Minister John Baird and those of critics of the decision. Overall, six in ten respondents (64%) either strongly or somewhat supported the decision while 18% opposed the decision. Support was highest among Conservative Party supporters and among older Canadians. The results of this study indicate that when it comes to Iran, Canadians hold mixed views on the threat Iran poses to Canada and the world and what role Canada should play in preventing the development of nuclear weapons in Iran. 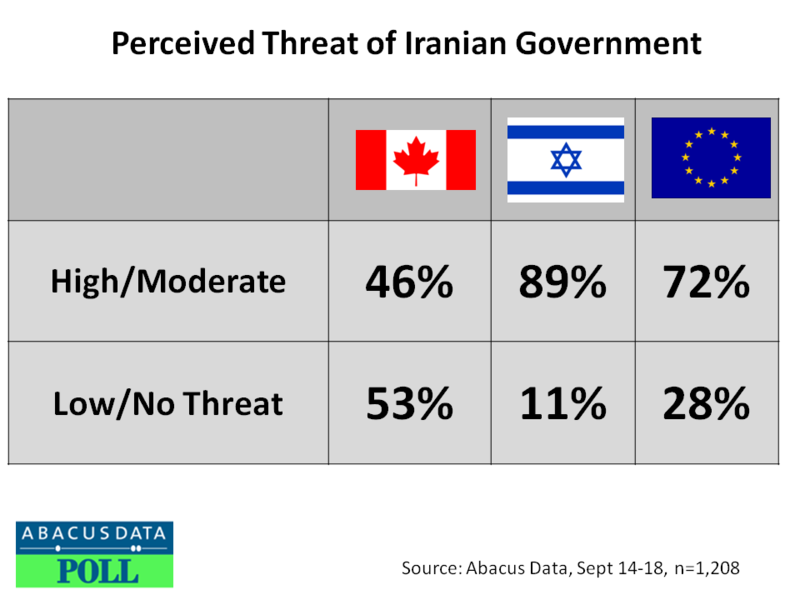 Most Canadians do see the Iran government as an immediate threat to Canada yet a large majority believe it is a major threat to Israel and a somewhat lesser threat to Europe. What is clear from the research is that Canadians do believe that if left to their own devices, the Iranian government will develop nuclear weapons in the next five years and more shocking, 60% believe the current government is likely to use those weapons against another country. Given that most Canadians do not think the Iranian government poses much of a threat to Canada, it is not surprising that only a small number support Canada assisting or joining military action in the region. Support for air strikes against Iran is higher than the use of ground troops but Canadians by and large are weary of any Canadian involvement in the region. Although there is only tepid support for direct military action, a majority of Canadians do support stricter economic sanctions and diplomatic pressure. Most support the government’s decision to end diplomatic ties with Iran. If tension in the region increases and Canada is called upon to play a role, public opinion may shift. However, there is currently little appetite among Canadians for direct military involvement, especially since most Canadians believe the Iranian regime to be unpredictable and capability of using significant force against neighbouring countries and those it deems as threats. Download the full report and release.